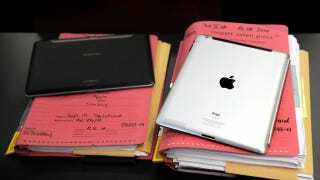 District Judge Lucy Koh stopped short of granting Apple an injunction that bans the sale of the Galaxy tablet in the US. She believed Apple's one utility patent was not grounds for an injunction, but will consider the possibility of an injunction based on Apple's three design patents. It will be up to Apple to prove that these patents are valid and that Samsung has infringed upon them. A formal order will issued "fairly promptly" she said.